The Castrol Spheerol EPL 3 comprises general purpose greases designed for plant wide lubrication. The range extends from a Castrol Spheerol EPL 3 for general purpose bearing lubrication to a NLGI 00 (see separate data sheet) semi-fluid grease suitable for centralised lubrication systems and grease filled gearboxes. Castrol Spheerol EPL 3 greases provide good protection against rust and corrosion as well as resistance to water wash-out; which makes them particularly suitable for equipment where moist or wet conditions are common. The stiffer consistency afforded by a Castrol Spheerol EPL 3 grade makes this product particularly suitable for the lubrication of bearings that are vertically mounted, or components exposed to a high degree of vibration. The good levels of resistance to both corrosion and water wash-out, which makes this product suitable for equipment where moist or wet conditions are common. Your advantage! Price of CASTROL SPHEEROL EPL 3 drops automatically in larger quantities. The Spheerol EPL 2 comprises general purpose greases designed for plant wide lubrication. 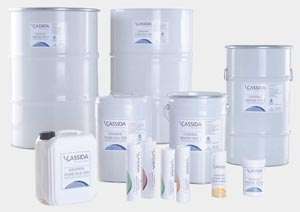 These greases provide good protection against rust and corrosion as well as resistance to water wash-out; which makes them particularly suitable for equipment where moist or wet conditions are common. The good levels of resistance to both corrosion and water wash-out, which makes this product suitable for equipment where moist or wet conditions are common. Your advantage! Price of CASTROL SPHEEROL EPL 2 drops automatically in larger quantities. The Spheerol EPL 1 comprises general purpose greases designed for plant wide lubrication. These greases provide good protection against rust and corrosion as well as resistance to water wash-out; which makes them particularly suitable for equipment where moist or wet conditions are common. The good levels of resistance to both corrosion and water wash-out, which makes this product suitable for equipment where moist or wet conditions are common. Your advantage! 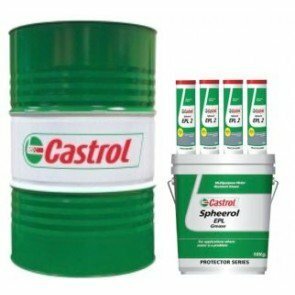 Price of CASTROL SPHEEROL EPL 1 drops automatically in larger quantities. The Spheerol EPL 00 comprises general purpose greases designed for plant wide lubrication. These greases provide good protection against rust and corrosion as well as resistance to water wash-out; which makes them particularly suitable for equipment where moist or wet conditions are common. The good levels of resistance to both corrosion and water wash-out, which makes this product suitable for equipment where moist or wet conditions are common. Your advantage! 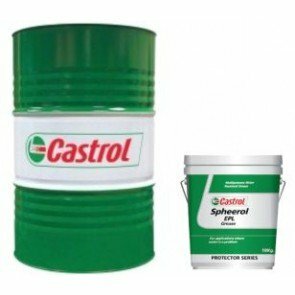 Price of CASTROL SPHEEROL EPL 00 drops automatically in larger quantities.